And the character announcements start pouring in. I swear, this is Hyrule Warriors all over again. We already knew that the upcoming Musou action game Dragon Quest: Heroes was going to feature characters from other entries in the series on top of an original cast, and we have our first confirmation outside of the initial bunch. Who are the lucky duo? Well, how about the lovable Cockney blabbering brute Yangus or the blazing redhead Jessica from Dragon Quest VIII? In an interview with Famitsu, translated by Gematsu, Koei Tecmo General Producer Kou Shibusawa confirmed the inclusion of Jessica because his wife gave him the confidence to nag series creator Yuji Horii about it. "We try to strike a balance among the characters in terms of jobs and weapons and whatnot, so by and large, we've left it up to you [Horii] to hash out who should appear. But there was one character I just had to step in and implore be included and I said, 'I want you to put Jessica in the game!' My wife is always pushing me to be more assertive, so I thought I'd actually stand up and say something for once." As for Yangus, Horii, who has wanted to make a Dragon Quest action game for ages, Shibusawa explains that he just enjoys seeing characters interact with others they wouldn't be able to in the main series. "It's fun to be able to bring these characters together from disparate games, especially ones that could never encounter one another in the normal games. Aside from Jessica, Angus will also be showing up to help represent the old geezer crew." 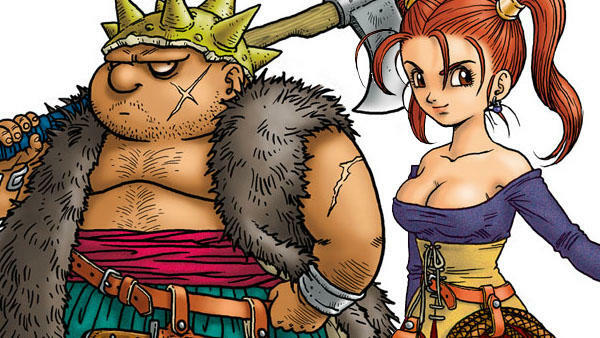 So far, Yangus and Jessica join Dragon Quest IV's Alena, Maya and Kiryl and Dragon Quest VI's Terry as the other confirmed characters from mainline games. If you have no idea who these people are, then be sure to check out our comprehensive look at the history of Dragon Quests releases in America. Dragon Quest: Heroes is a Musou style action game by Omega Force at Koei Tecmo, and it will be released for the PlayStation 3 and PlayStation 4 in spring of 2015. The company has expressed interest in bringing it to the United States, but it has stopped short of confirming anything.